Episode 2 of Music in Mind is up! I talk about improvisation in its relation to my own music. 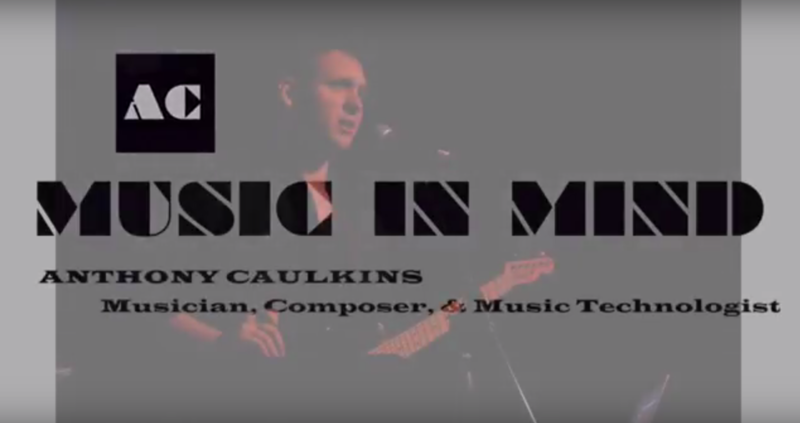 Episode 1 of my video series, Music in Mind, is up! In this episode I talk about my latest project, Songs For A New Era, as well as life as a gigging musician in the Los Angeles area. This patch deals with randomness and probabilities to create constantly changing drum rhythms over a backing track. In order for the patch to work properly, you will need to download this zipped file of samples and direct Max file directory to the folder containing the samples. 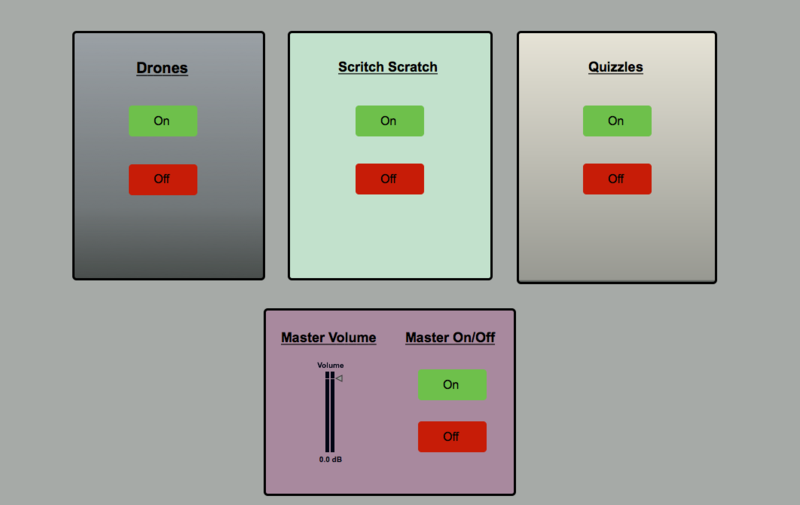 This patch is an early example of using control functions to create a constantly evolving texture, with three possible sound types: drones, scratch sounds, and quizzles (whatever those are!). 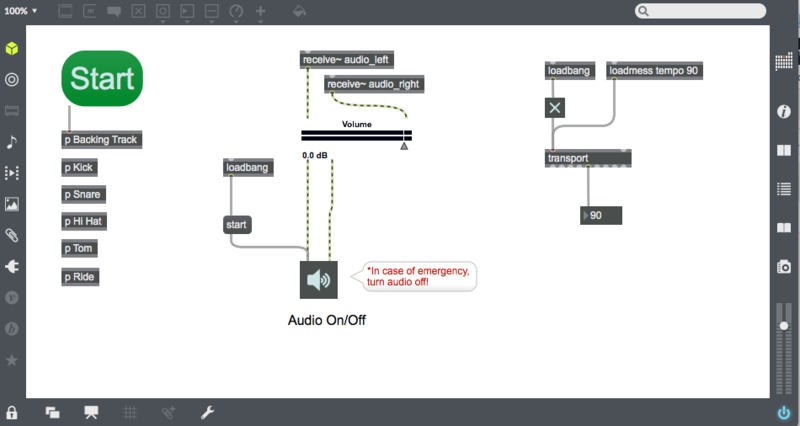 NOTE: To access the above shown interface, open the patch in presentation view. Songs For a New Era is my most recent project. For the past seven years, or so, I have worked hard at academic composition, so I figured that it was time for a change. 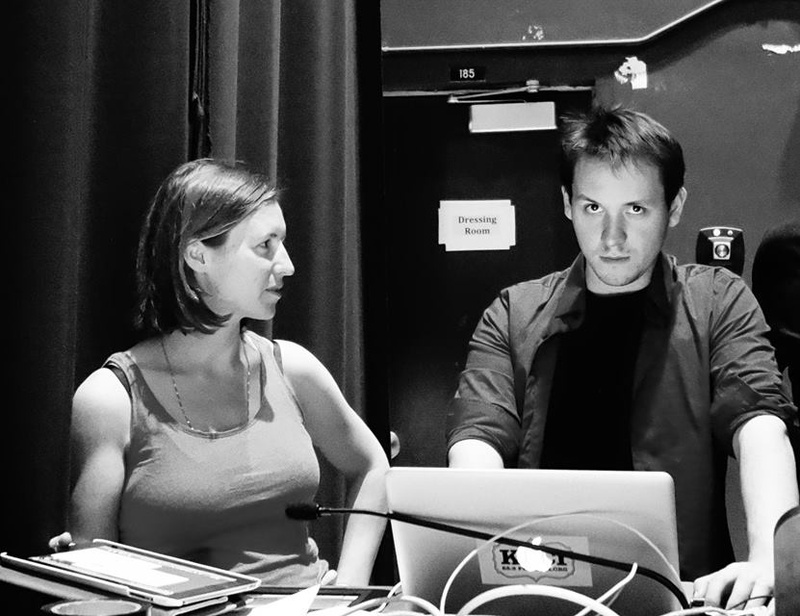 This project is an electronic rock show that integrates improvisation, songwriting, and interactive computer technologies. 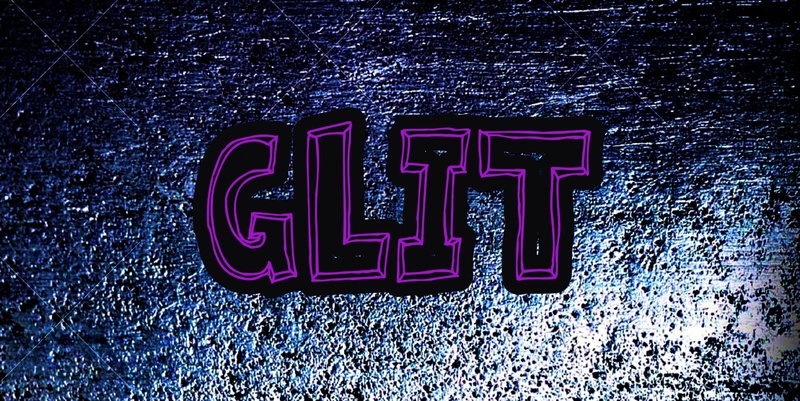 GLIT is an industrial hip-hop duo, featuring Richard Savery and Anthony Caulkins. After completing their degrees at UC Irvine, Richard and Anthony began experimenting with integrating the sounds of noisehop into their own performance practices of jazz and heavy metal. Through this they have developed a dance based style of music with a dark and noisy soundscape. The Real Pretenders is a dark indie duo featuring Anna Savery and Anthony Caulkins. Through this collaboration, we explore the acoustic worlds of beauty and ugliness using original and cover songs. A new set recordings from my experimental rock/jazz group, Coyote The Mist. My MFA thesis project involving an exploration of the idea of musical gesture as a computational tool. Flares – a rock-based exploration of the contrasting relationship between aggressive rock gestures, containing a high degree of rhythmic energy but remaining relatively dynamically static, with softer lyrical gestures, containing great dynamic variation. Throughout this work, these types of gestures interact, combine, and contrast in various ways. Hold It – a work exploring different types of gestural material written in a multi-voice counterpoint. The counterpoint of this pieces extends outside of the musical realm into dance whose gestural material is added to the contrapuntal texture of the work. With the two-voice piano part and two dancers, the complete structure of this work is a ‘four-voice’ texture of gestural interaction. Marble – a piece that explores the notion of breath as gesture. Each of the long tones held by the musicians undergoes a great deal of dynamic and textural contrast, creating slow moving harmonic changes throughout the duration of the work. Interactive lighting behind the performers serves to illustrate the gestural contour of the long tones, as well as the harmonic relationships among musical voices. E-Motions – a four-part improvisation, combining guitar, computer, and two dancers, all interacting with each other in a perpetual feedback loop. The improvisation of this piece is based on a predetermined collection of gestures which each performer explores in their own way, while being constantly informed by other performers on stage. This is the most extreme piece on the program, in terms of open boundaries on the gestural exploration. The test is to see if general gestural information can be used to create a satisfying artistic experience. Another Blank – nothing but a blues tune. This is an etude in substituting gesture for harmony. Another Blank is an experiment in using gestural information to illustrate a well known and important African American musical form. The specific gestures employed in this piece are informed by the expressive content that makes the blues such an evocative language, such as bends, moans, walking bass lines against syncopated rhythms, etc. E-Scape – explores a similar idea to Another Blank in that it presents a basic chord progression in the form of a gestural progression. The material for this work was inspired by images of downtown Los Angeles, which is projected onto the performers while they play. The combination of the “gesture chord progression” and the changing imagery is designed to test the ability of musical gesture to express similar ideas as more traditional harmony in music. A Bit Here and There – much like Flares, A Bit Here and There is another rock based exploration of open gestural improvisations contrasted by heavy rock grooves, built on asymmetrical rhythmic patterns, which change in proportion over the course of the piece. Throughout this work, there are various ensemble textures derived from subsets of the whole group, that are explored in order to bring out different combinations of gestural material. This is our first set of recordings of improvisations, entitled Love Songs.